French toast is a rare treat that some people indulge in occasionally. A combination of eggs, butter, salt, milk, bread and a frying pan does not make for a healthy everyday snack. 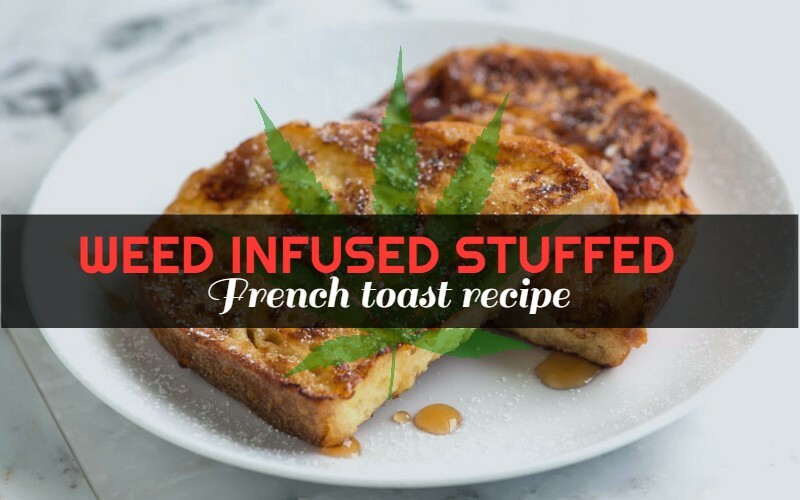 But if you are going to indulge, then it might be a good idea to go the whole hog and try some weed infused stuffed French toast. Starting the day with weed French toast with some honey for good measure is a dream start to any day, if only once in a while. The process is essentially the same, just that you are going to be using cannabis butter instead of full fat Kerry gold butter. If you know how to make French toast, cannabis French toast is nearly identical! Brush two slices of the bread with the melted marijuana butter. Put some cheese and jam on top and make a sandwich with another slice of buttered bread. In the bowl, whisk the eggs and milk together into a delicious milk. In a small frying pan, melt the cannabis butter. When the butter starts to melt and fizzle, add the sandwiches. Cook until each side is golden brown, making sure to cook each side. That is pretty much all there is to Cannabis French Toast, with some jam. You can put some honey, salt and/or sugar on top if you really want. Not exactly a healthy treat, but this toast is bound to leave you satisfied. And you might come back for more if you get the munchies! Serves two.